Looking for an easy to use camera with plenty of zoom? One that takes high-resolution photos and high quality home movies? 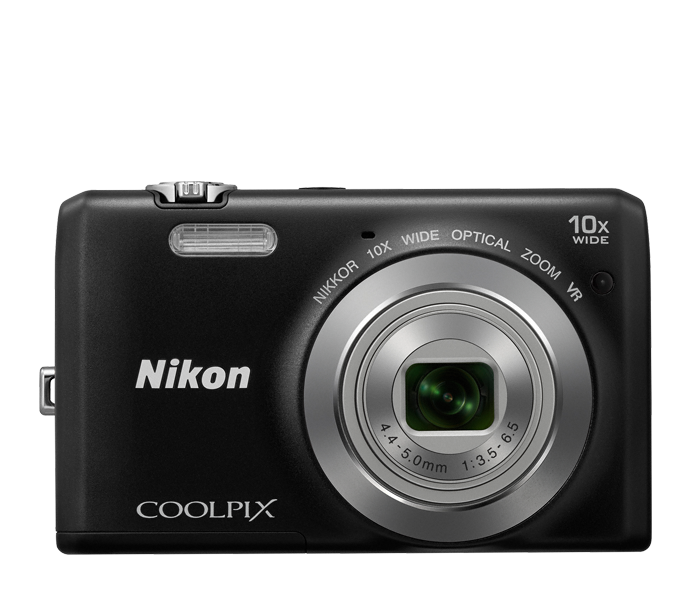 Look no further than the COOLPIX S6700! Zoom in with the power of a 10x optical zoom NIKKOR glass lens with Vibration Reduction technology, or get even closer with up to 20x Dynamic Fine Zoom. Target Finding AF system keeps focus where it belongs, even as your subject moves around the frame. Want better photos of your friends and family? Just activate the Smart Portrait System and let the COOLPIX S6700 create flattering portraits of the people you care about. You can even easily add fun special effects. Style, zoom power, image quality and a great value—this camera has it all! Every COOLPIX is designed around a genuine NIKKOR glass lens, the legendary optics that have helped make Nikon famous. The COOLPIX S6700’s 10x optical zoom lens goes from wide-angle—great for portraits and landscapes—all the way up to telephoto—great for closeups of sports, concerts, nature and more. When you need even more reach, zoom up to 10x with optical zoom and 20x with Dynamic Fine Zoom, an enhanced digital zoom function that effectively doubles your reach. When a photo alone won't do, press the dedicated video button and instantly start recording HD 720p video in widescreen format while the built-in microphone captures the sounds of the moment in high fidelity. When you're ready to share your creations, use an optional audio video cable to connect to your compatible TV. Your friends and family will see your movies come to life on the big screen. It's frustrating when a smartphone camera focuses on the wrong thing. With COOLPIX S6700, Target Finding AF instantly and accurately determines your intended subject and focuses on it—not on just whatever is closest to the camera. Catch the shot you want on the first try. No more out of focus shots or the frustration of trying to get the camera to focus on the right thing. Smart Portrait System makes it easy to create beautiful photos of the people you care about. Turn it on, and several portrait-optimizing features activate. Face Priority AF finds and focuses on faces. Skin Softening applies an attractive soft focus effect. The camera can even automatically take a photo the instant someone smiles! Your loved ones will always look their best. Lens-Shift Vibration Reduction keeps the shot steadier, even if your hands are not. Say goodbye to blurry photos, shaky videos and tripods. Easily apply fun and creative Image Effects like Selective Colour, Miniature, Skin Softening and more right from the camera—no need for additional photo or video-editing software. Wondering how that photo would look in black & white? As an artistic illustration? Easily preview a select of fun Quick Effects on photos you’ve already taken, then save your favourites alongside the original. The COOLPIX S6700's large, 3.0" LCD display makes it easy to compose your shots or monitor your video recording. Reviewing and sharing your creations is a pleasure, too—every shot looks fantastic on the display.